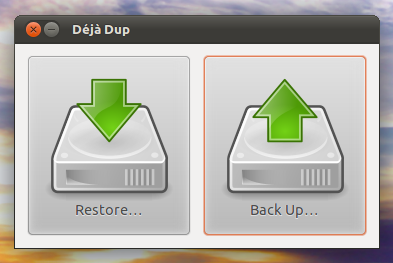 Déjà Dup is just a GUI built around the command line backup tool, duplicity. It uses rsync to generate incremental backups and also supports encryption to protect your data against un-authorized access. 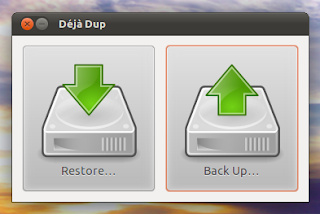 The primary use case of Déjà Dup is to backup and restore 'user files'. Déjà Dup is purely a Gnome backup tool and it integrates well into the environment. You get an option in the right-click context menu in Nautilus to "Restore Missing Files..." thus making the restoration process even simpler. Over the Network backups including SSH, FTP or Windows Share. You'll need to reboot your PC once installation completes so that Déjà Dup can integrate into your desktop environment. In Unity, press the <Super> key and search for 'Deja Dup' or in Gnome, go to Applications > System Tools and open up Déjà Dup. Go to Edit > Preferences and you'd see this dialog. There are 3 Tabs. Storage, Files and Schedule. Under Storage, you can choose your preferred backup location, enter the IDs for Cloud Storage accounts and also choose to either encrypt or not encrypt your data. Under Files, you can define the folders that you want to backup or want to exclude from the backup process. Under Schedule, you can configure how often you want to backup your data. Déjà Dup doesn't yet support exact backup timings meaning that you would need to choose Daily, Weekly, Monthly but can't configure 'Daily at 4 a.m'. That is a missing feature being developed and would get there soon, hopefully. Once configured, click the 'Backup' button on the main Déjà Dup window and it would start backing up your files immediately. As announced, Déjà Dup would be included by default in Ubuntu 11.10 and would support Ubuntu One as well. In fact, Ubuntu One support is already there in under-development 11.10.